A very firm demand reported for an entry of 1,302 Cattle at Clogher Mart on Saturday, April 6 with a large attendance of buyers present all over the province insuring strong prices in all sections. In the fatstock ring 384 lots listed sold easily with beef cows selling to £1,760 for a 1,000kg Limousin at £176 per 100kg followed by an 830kg Simmental to £173 to total £1,435.90. Cow heifers sold to £1,391.60 for a 710kg Charolais to £196 per 100kg followed by a 750kg Belgian Blue to £175 totalling £1,312.50. Fleshed Friesian cows sold to £114 per 100kg. Leading prices for beef cows and cow heifers in the fatstock ring as follows: Loughgall producer 710kg Charolais to £196 (£1,391.60), Tempo producer 620kg Limousin to £185 (£1,147), Cullyhanna producer 1,000kg Limousin to £176 (£1,760), Coalisland producer 650kg Belgian Blue to £175 (£1,137.50), Dungannon producer 660kg Blonde d’Aquitaine to £175. Newtownbutler producer 830kg Simmental to £173 (£1,435.90), Greencastle producer 690kg Limousin to £173. Lisbellaw producer 610kg Aberdeen Angus to £172. Dungannon producer 660kg Blonde d’Aquitaine to £171. Dungannon producer 620kg Limousin to £170. Fleshy Friesian cows sold from £106 to £114 per 100kg. Poorer types sold from £64 to £80 per 100kg. Ballinamallard producer 990kg Limousin to £148 (£1,465.20), Tassagh producer 1,000kg Charolais to £134 (£1,340) and Fintona producer 1,160kg Charolais to £133 (£1,542.80). 640kg Charolais to £196. 600kg Aberdeen Angus to £187. 620kg Blonde d’Aquitaine to £177. 580kg Aberdeen Angus to £166. 530kg Limousin to £162. 510kg Belgian Blue to £150. 630kg Aberdeen Angus to £201. 520kg Aberdeen Angus to £201. 620kg Aberdeen Angus to £198. 530kg Simmental to £196. 510kg Simmental to £194. 520kg Simmental to £194. 570kg Charolais to £192. 580kg Limousin to £188. 670kg Charolais to £179. 590kg Limousin to £177. 650kg Charolais to £176. 590kg Limousin to £175. 610kg Limousin to £174. 620kg Fleckvieh to £167. 560kg Limousin to £203. 620kg Limousin to £198. 610kg Limousin to £187. 590kg Limousin to £186. 620kg Limousin to £186. 530kg Blonde d’Aquitaine to £186. 640kg Belgian Blue to £185. 660kg Belgian Blue to £178. 500kg Charolais to £175. 460kg Belgian Blue to £206. 570kg Limousin to £196. 610kg Charolais to £191. 600kg Limousin to £190. 630kg Charolais to 3183. 680kg Aberdeen Angus to £182. 460kg Aberdeen Angus to £178. 650kg Aberdeen Angus to £172. 540kg Charolais to £170. 580kg Aberdeen Angus to £161. 570kg Aberdeen Angus to £160. 470kg Limousin to £156. A much brighter demand in this section with strong stores selling from £187 to £214 per 100kg. Medium weights sold from £197 to £256 per 100kg. Leading prices: W Smyton, Fintona 680kg Limousin to £1,400 (£206), 680kg Limousin to £1,375 (£202), 680kg Limousin to £1,345 (£197) and 620kg Limousin to £1,285 (£207), Roy Hall, Fivemiletown 640kg Charolais to £1,370 (£214), 680kg Limousin to £1,340 (£197) and 630kg Limousin to £1,315 (£209), P McLaughlin, Dungannon 640kg Limousin to £1,340 (£209) and 620kg Charolais to £1,280 (£206), J Lynch, Coalisland 640kg Charolais to £1,325. J Greenaway, Portadown 650kg Charolais to £1,320, 620kg Charolais to £1,280 and 590kg Charolais to £1,265 (£214), H Keys, Fivemiletown 680kg Charolais to £1,300. A Trotter, Caledon 640kg Charolais to £1,285. S Crawford, Fermanagh 610kg Limousin to £1,280 (£210) and E Nugent, Keady 630kg Charolais to £1,280. J J Breen, Tempo 450kg Charolais to £1,135 (£252), B Daly, Armagh 490kg Charolais to £1,120 (£228), D Monaghan, Cookstown 470kg Limousin to £1,100 (£234), 440kg Limousin to £1,055 and 450kg Limousin to £1,040. 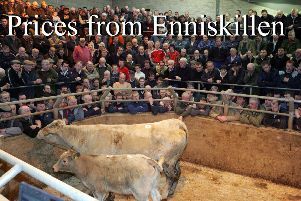 E McKay, Armagh 430kg Charolais to £1,100 (£256), E F Fitzpatrick, Newtownbutler 470kg Charolais to £1,085 and 410kg Charolais to £975. J J Beggan, Rosslea 440kg Charolais to £1,075, 450kg Charolais to £1,060 and 440kg Charolais to £1,060. F McStay, Lurgan 470kg Hereford to £1,070 (£227), 500kg Hereford to £1,000. J P Black Co, Antrim 470kg Charolais to £1,065 (£226), 500kg Aberdeen Angus to £985 and 410kg Charolais to £985. J A Mitchell, Seskinore 470kg Simmental to £1,045. K A Parsons, Tempo 470kg Charolais to £980. J Corrigan, Fintona 430kg Charolais to £975. R A Elliott, Dungannon 410kg Charolais to £975. E F Fitzpatrick 380kg Charolais to £830, 290kg Limousin to £755, 320kg Charolais to £745, 320kg Aberdeen Angus to £700 and 260kg Limousin to £540. N Patterson, Ballygawley 350kg Charolais to £795. Alister Stinson, Crubinagh Road, Dungannon 340kg Aberdeen Angus to £680. B Kelly, Armagh sold a selection of Friesians 310kg to 330kg to sell from £450 to £575 each. A larger entry sold to a firmer demand with strong stores selling from £191 to a high of £225 per 100kg medium weights sold from £200 to a high of £239 per 100kg Leading prices: G Brodison, Stewartstown 670kg Charolais to £1,325 (£198) and 630kg Charolais to £1,200 (£190), A Sloane, Armagh 560kg Charolais to £1,265 (£225) and 510kg Charolais to £1,120 (£219), R Martin, Portadown 620kg Charolais to £1,250 (£201), 550kg Limousin to £1,190 (£216), 550kg Charolais to £1,185 (£216), 540kg Charolais to £1,185 (£219), 580kg Aberdeen Angus to £1,160 (£200), 530kg Simmental to £1,155 (£218), 590kg Limousin to £1,130, 550kg Limousin to £1,130 (£205) and 570kg Limousin to £1,110. J Allen, Ballygawley 580kg Charolais to £1,235 (£213) and 580kg Charolais to £1,230 (£213), Pomeroy producer 540kg Limousin to £1,140 (£211), D Williamson Portadown 500kg Limousin to £1,125 (£219) and K Stewart, Aughnacloy 500kg Limousin to £1,100 (£220). J Allen, Ballygawley 490kg Limousin to £1,100 (£224), A Sloane, Armagh 460kg Charolais to £1,100 (£239), 480kg Charolais to £1,070 (£223), J R Hunter, Maguiresbridge 490kg Limousin to £1,100 (£224) and 480kg Charolais to £1,045. S Crawford, Fermanagh 470kg Limousin to £1,095 (£233), G Crawford, Clogher 480kg Limousin to £1,090 (£227), 480kg Limousin to £1,035, 440kg Limousin to £1,010 and 450kg Limousin to £975. Rosslea producer 500kg Charolais to £1,050 (£210), 470kg Charolais to £1,030 (£219) and 490kg Charolais to £980. P Carr, Newtownhamilton 490kg Aberdeen Angus to £1,040. J Carrothers, Fivemiletown 480kg Limousin to £1,015. M and N O Conner, Augher 470kg Charolais to £990 and 480kg Limousin to £960. T D Willis, Dungannon 430kg Aberdeen Angus to £990. K Stewart, Aughnacloy 470kg Limousin to £970. K Stewart, Aughnacloy 350kg Limousin to £1,030 (£294), J Gervis, Ballygawley 400kg Charolais to £1,000 (£250), D Williamson, Portadown 390kg Belgian Blue to £875. J Cassidy, Rosslea 370kg Limousin to £850 and 330kg Limousin to A Aughnacloy 390kg Lithuanian Black and White to £800. William Vogan, Killylea 370kg Aberdeen Angus to £800 and 370kg Aberdeen Angus to £755. M/S N and H Johnston, Newtownbutler 390kg Limousin to £755, 350kg Limousin to £700 and 340kg Limousin to £680. E Monaghan, Trillick 380.kg Limousin to £720. R J Woods, Garvary 360kg Limousin to £700. Another good entry sold easily to a very keen demand with steers and bulls selling to £1070 for a 510kg Charolais (£210) for F Boyle, Rosslea. K McCrory, Sixmilecross 490kg Charolais to £1,030, G J McKenna, Clogher 420kg Limousin to £1,015 (£241), S McKenna, Clogher 380kg Charolais to £1,015 (£267), 410kg Charolais to £965 and 360kg Charolais to £945 (£262.50), I E and S E Johnston, Cookstown 430kg Limousin to £1,015 and 380kg Limousin to £955. G Cullen, Coalisland 480kg Charolais to £1,010 Kesh producer 510kg Limousin to £990, 420kg Belgian Blue to £990 (£236) and 430kg Limousin to £940. D Farrell, Fivemiletown 380kg Limousin to £980 (£258), C Maguire, Brookeborough 470kg Charolais to £965. J F McClave, Rosslea 460kg Aberdeen Angus to £960. D J Doherty, Currin 400kg Charolais to £960 (£240), S S Dunlop, Ballygawley 370kg Limousin to £955 (£258) and S Holland, Clogher 450kg Simmental to £950. S Crawford, Fermanagh 400kg Charolais to £945 (£236), 340kg Limousin to £905 (£266) and 320kg Limousin to £870 (£272), S McQuaide, Ballinamallard 430kg Limousin to £920 and 390kg Limousin to £805. R Wiggam, Aughnacloy 390kg Charolais to £865. D O’Hagan, Maghera 450kg Charolais to £850. S Smyth, Rosslea 340kg Limousin to £845 (£248) and 370kg Charolais to £795. T Cullen, Belcoo 390kg Charolais to £840, 360kg Charolais to £830 (£230), C Fee, Tempo 300kg Charolais to £840 (£280), A Collen, Tandragee 410kg Cxh to £830. G J McKenna, Clogher 370kg Limousin to £820, S Holland, Clogher 400kg Limousin to £820. N R Knox, Ballygawley 370kg Limousin to £815. M J McKenna, Augher 380kg Charolais to £815. Kesh producer 360kg Limousin to £810 (£225). A good selection on offer sold to a steady demand with a Derrygonnelly producer selling a selection of second calvers to make £1,860, £1,820, £1,800, £1,770, £1,700 and £1,280. Dungannon producer £1,600 for calved heifer. Dungannon producer £1,600 for calved heifer. Ballygawley producer £1,500 for calved heifer. Newtownbutler producer £1,500 for calved heifer. Several others sold from £1,050. young maiden heifers sold to £540 each. Pedigree registered Limousin (born 27/05/2011) to £1,350. Pedigree registered Simmental (born 17/05/2015) £1,200. Young Pedigree registered Aberdeen Angus (born 12/05/2011) £1,000. Another good turnout sold to a brisk demand with an Augher producer selling heifers with heifer calves to £2,000 and £1,800 with a heifer and bull calf to £1,905. Dromore producer £1,845 for 2012 cow with bull calf. Aughnacloy producer £1,830 for second calver with bull calf. Eglinton producer £1,800 for heifer with bull calf. Omagh producer £1,550 for 2013 incalf cow. Glenavy producer £1,400 for 2010 cow with bull calf. Dungannon producer £1,355 for Fleckvieh heifer with bull calf. Several other outfits sold from £1,040 to £1,270. A large entry sold easily to a strong demand with bull calves (under 2 months) selling to £500 for Limousin and £395 for Charolais to an Aughnacloy producer. Greencastle producer £435 for Charolais Aghalane producer £370 and £270 for Belgian Blues. Omagh producer £355 for Aberdeen Angus and £260 for Hereford. Keady producer £350 for Simmental, Magheraveely producer £350 for Belgian Blue, Trillick producer £350 and £335 for Aberdeen Angus. Lisnaskea producer £295 for Hereford. Brookeborough producer £505 for Charolais, Coalisland producer £500 for Limousin, Aughnacloy producer £410 for Charolais, Lisnaskea producer £405 for Charolais, Lisbellaw producer £400 and £385 for Limousins, Clogher producer £380, £375 and £365 for Charolais. Dungannon producer £345, £335 and £325 for Limousins and Derrylin producer £265 for Aberdeen Angus. Killyman producer £700 and £650 for Charolais. Dromore producer £685 for Limousin £645 for Simmental and £635 for Aberdeen Angus, Ballygawley producer £680 for Limousin, Lisbellaw producer £635 and £550 for Herefords. Coalisland producer £630 for Charolais and £580 for Limousin, Glenavy producer £535 for Aberdeen Angus, Newtownbutler producer £550 for Simmental, Greencastle producer £520 for Charolais and Aughnacloy producer £505 for Hereford. Killyman producer £550 x 2 and £495 for Charolais £490, £390 and £350 for Blonde d’Aquitaine. Ballygawley producer £515 for Simmental, Aughnacloy producer £500 for Limousin, Fermanagh producer £500 for Simmental and £475 for Limousin and Coalisland producer £500 for Limousin.